WE JUST CRACKED OPEN A FEW BOXES STUFFED FULL OF MEXICAN RECYCLED GLASSWARE. THIS LINE OF GLASS IS SOMETHING WE'VE CARRIED SINCE THE VERY BEGINNING AND WE ABSOLUTELY LOVE. EACH PIECE IS HAND-BLOWN, SO THEY'RE FULL OF CHARACTER AND SUBTLE VARIATIONS. OUR FAVORITE THING ABOUT THESE BABIES IS HOW HEARTY THEY ARE! 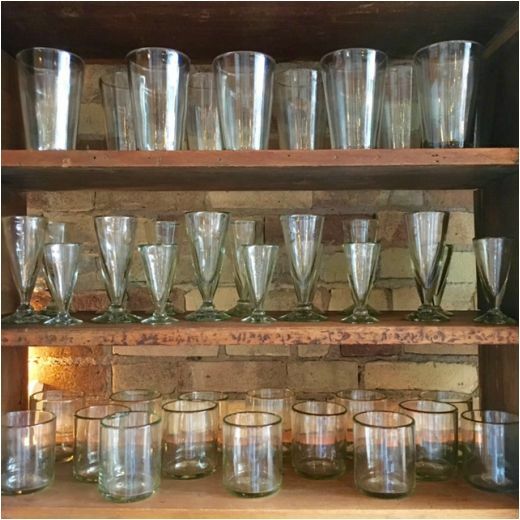 THE GLASSES HAVE A VERY SATISFYING WEIGHT IN YOUR HAND AND ARE DURABLE, SO THEY'RE GREAT FOR FAMILIES OR THE EVER-SO-SLIGHTLY-CLUMSY (WHICH DESCRIBES MORE THAN A FEW OF US HERE AT THE SHOP).